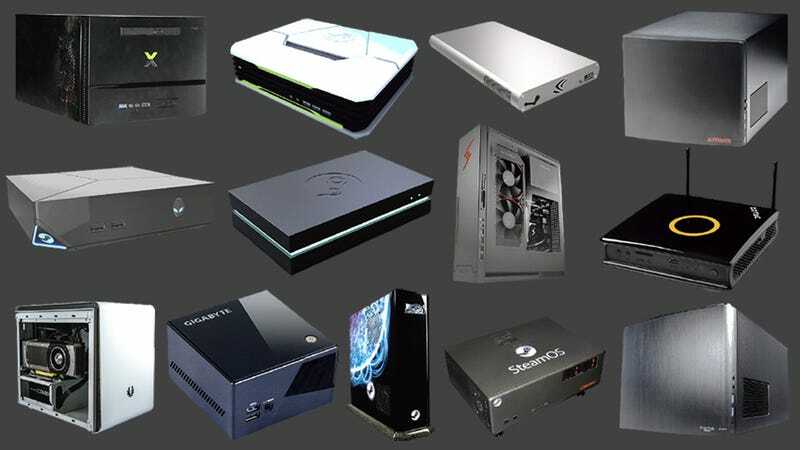 Last night, Valve announced and showed off a collection of 13 different third-party Steam Boxes at its CES event. What Valve didn't do was rank them for you. We've taken the liberty of handling that, based on criteria that's almost entirely arbitrary. It's worth noting that we haven't actually used any of these Steam Boxes; many of them barely even exist as more than a prototype box. So instead of "experience," we're ranking the boxes based on design, guts, company heritage, and a bunch of other highly subjective factors. The following is canon. It looks like a crumby router, and chances are you already have a crumby router that looks like a crumby router. And specs? Literally all of them are TBD, so no redeeming qualities there. Yet. Take heart Zotac, there's still hope. These two are tied for second-to-last because they are, at a glance, practically indiscernible because neither has so much as one noteworthy characteristic. They look as original as a pair of cardboard boxes, and they're huge. Like old, 70s speakers, expect they play video games. Guts-wise both rock Core i5 processors and GTX 760s, but it's almost not worth mentioning since they're both so fugly. It's thin, but so long. It's going to take a seriously goldilocks sort of situation to fit this on your entertainment center. Maybe you just put your TV on it? Even then, it looks like a piece of medical equipment, a slice of an operating table. Core i3 and GeForce GTX 765M? Meh. Maybe cooler if it was more portable, but that shape! What? Like the CyberPowerPC, the iBuyPower has two processors too, AMD and Intel, though no details on what they are specifically. For graphics it has Radeon GCN. And while I appreciate what the iBuyPower is going for, something about its lit-up-middle execution comes off disappointingly. It reminds me of a shoebox. The Next Spa is pretty indistinctive; the most boring of the black boxes we've seen so far. But inside, it has a Intel Core i5, Nvidia GT760 and 8GB of RAM, which is not bad at all! It's just hard to get excited about in a body this meh. This one's decked out in armor! It's like a cross between a Stormtrooper and Master Chief. Not sure how much I dig that Mountain Dew-green light, but OK sure. Inside, it's got a Core i5 and Nvidia GTX 670, but that's not all; it has an AMD core and a Radeon R9 270 too. Mountain Dew-light forgiven. This glowy sucker looks like an evil TiVo, and we like that! But it's hard to rank it any higher because its internals are all TBD. They'll probably be pretty killer, but you never know. And a neon VCR that plays games at 60 FPS is way better than one that plays em at 30. Ditto. The Tiki is undoubtedly powerful (customizable CPU, GTX Titan), but not only does it look like a PC; it looks dumb. If you have a living room this would look OK in you need a new living room. Another box repping the "block" style, the Brix Pro is a cube of joy. About as slick as a black chunk can get. Inside, the Brix rocks a Core i5 4440, 8GB of RAM, but only Intel Iris Pro 5200 when it comes to graphics. You're laughing. Don't laugh! This is a Steam Box built for portability, not power. And that's going to be worth a whole lot. Another box with a pedigree, the Digital Storm is doubtless a well-made (and liquid cooled!) machine. And with a Core i7 4770K, GTX 780 Ti, and 16GB of RAM, it's a damn powerful one too. So why not higher? It looks exactly like a PC. Of course, it is just a PC, but still. How boring. Where the Chronos was endearingly VCR-looking, the Webhallen is endearingly mini-fridge-esque. A boxy but minimalist approach done right. Inside, the fun continues with a Nvidia GTX 780, an Intel Core i7 and 16GB of RAM. It's not quite as overpowered as the Chronos, but why should it be? There's beauty in restraint, even if it's just a little restraint. Of the same lineage of the winner of our Best Gaming PC under $1,500 battlemodo, the Origin PC Chronos has some good genes. More impressively, though, that it can pack a pair of Nvidia GTX Titans, 32 gigs of RAM, and an Intel Core i7 into its squat frame. Yeah, it also looks sorta like a VCR, or maybe a stereo receiver, but that's endearing. No, really! It is!